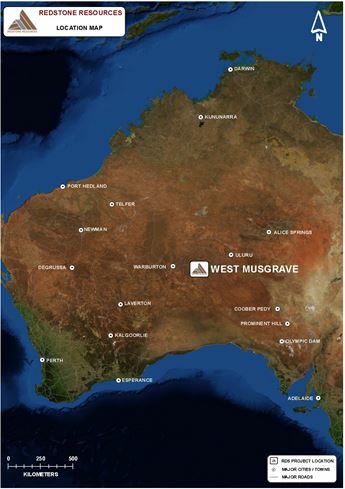 Redstone’s 100% owned Tollu Project is located in the south-east portion of the West Musgrave region of Western Australia (Figures 1 and 2). The Tollu Project consists of a large swarm of hydrothermal copper rich quartz veins in a mineralised system covering an area at least 5km2. Malachite-rich gossans associated with quartz veins are exposed at surface and form part of a dilatation system between two major shears within the Tollu Fault Zone. A large part of the tenement remains underexplored. Redstone’s 2015 drilling campaign resulted in the delineation of its maiden JORC Mineral Resource for the Tollu Project estimated to be 3.8Mt @ 1.0% copper, containing 38,000 tonnes of copper, including 8,000 tonnes of Cu oxide resource, and 0.01% cobalt, which equates to 535 tonnes of contained cobalt (Tollu Project JORC Resource). Following this drill campaign, the Conceptual Exploration Target (Target) for the Tollu Project was also reviewed, resulting in a significant increase in its size to 31 to 47 million tonnes of mineralisation at a conceptual grade range of 0.8 – 1.3% Cu, containing 259,000 to 626,000 tonnes of copper. The potential quantity and grade of the Target is conceptual in nature. It is important to note that there has been insufficient exploration to estimate a mineral resource and it is uncertain if further exploration will result in the estimation of a mineral resource. This Target is based on the current geological understanding of the mineralised outcrop area at Tollu, coupled with geophysical evidence to suggest that the mineralised environment extends beneath cover to the north and south. Importantly, a significant upgrade to the Forio Prospect was also defined, with the 2015 drilling identifying a mineralised strike over 250m and which remains open in all directions, despite the Forio Prospect displaying limited surface expression. The Forio Prospect Target tonnes now exceed the previously estimated conceptual exploration target tonnage by circa 10 times, supported by this limited early stage drilling and further highlights the improved potential for the Tollu Project. In addition to the increased mineralisation at the Forio Prospect is the identification of seven new Forio analogues and three previously identified “Forio look-alike” prospects (the Forio and Forio Analogues). Redstone has consequently reprioritised its existing exploration prospects and defined new prospects with the information gathered from the 2015 drilling campaign. The additional Forio analogues and increased Target are important to the economics of the Project. They provide a solid foundation to significantly expand both the copper oxide material at the Tollu Project and the Mineral Resource. 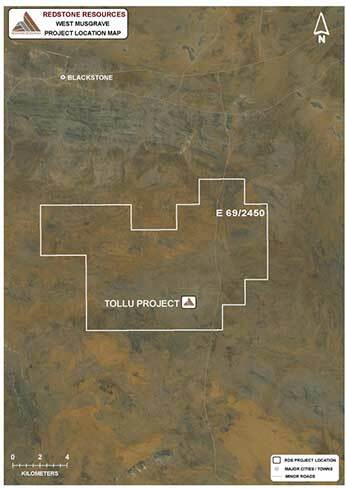 Given Tollu drilling data to date is constrained to less than 2% of the tenement area the upside to the Tollu Mineral Resource estimate with further drilling remains unlimited.